I know our lives are very busy, but if you get the chance before you attend, print out the conference schedule. Download the app. Plan your schedule. For conferences that are smaller, such as the Mid-Atlantic Regional Archives Conference, I like to actually print out the conference schedule (if it’s not too many pages). Maybe I’m old fashioned, but there’s something satisfying with circling the sessions I plan to attend. For larger conferences, such as the Society of the American Archivists, download the app and select the sessions you plan to attend. Planning ahead gives you a greater idea of everything that is offered. By planning ahead, you probably won’t miss a session because you “didn’t know about it.” Planning is always done with a pencil and eraser. This means that you don’t have to stay committed to those sessions. Chances are, you’ll decide to attend different sessions on the actual day(s) of the conference. And that’s a good thing. Tell everyone you will be attending this conference. How many times have I heard, “I didn’t know you were going to be here!” It’s great running into people at conferences you didn’t know were attending. However, sometimes you might run into them at the end of the conference and you don’t have enough time to talk. It would have been nice to plan ahead so you can grab a cup of coffee with that person earlier in the conference. How do you tell people? Start by e-mailing your previous co-workers, supervisors, and other archives-related contacts. This will start a conversation if you haven’t “talked” in awhile. Even if that person can’t come, this will give you the chance to plan another time to meet. Also, spread the word on social media. Tell your friends you’re attending this conference via Facebook, Twitter, Instagram, Tumblr, etc. Tag the organization hosting the conference and add relevant hashtags. 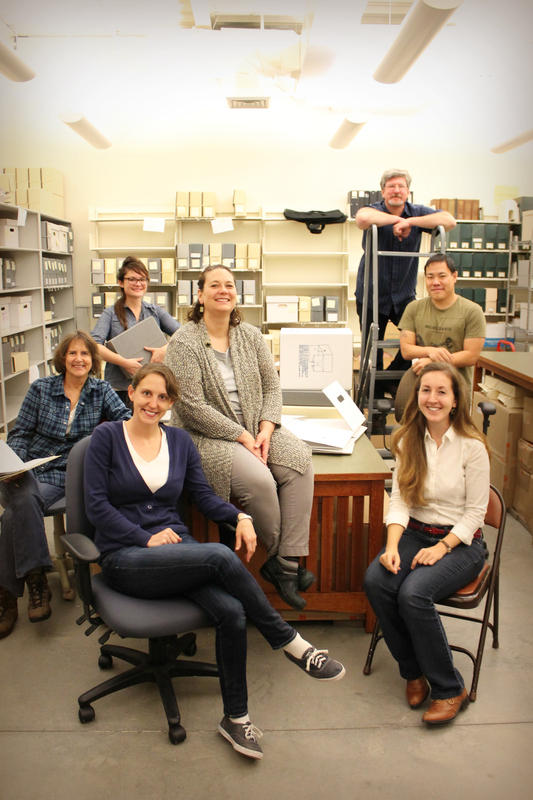 If it’s an archives-related conference, tell your archivist friends and also your non-archivist friends. You’d be surprised who might be interested that you’re attending. This summer at the Society of American Archivists (SAA) Conference in Washington, D.C., I posted to Facebook, “I am at SAA!” I immediately get a text from my non-archivist friend who saw my Facebook post. She asked if I will be going to the reception the next night at the Library of Congress. Of course I was attending, but I was kind of confused how she would know about it. It turned out, she was attending as someone’s guest! We ended up meeting at the reception the next day and had a great time! If you don’t have Facebook, Twitter, Instagram, Tumblr, or e-mail to spread the word, try sending smoke signals. Even though you planned your schedule ahead of time, leave some room for spontaneous encounters. When the day(s) to attend the conference finally arrives, you might change your mind to attend a different session than you planned. That’s ok. You never know what you’ll stumble upon. Maybe you should grab a cup of coffee with a new person you just met at the conference instead of sticking to your previously planned schedule. Maybe you should spend an extra 30 minutes in the exhibit hall. Whatever it is, don’t be tied down with your previously planned schedule and have fun. In May at the American Alliance of Museums (AAM) conference in Seattle, fellow CUA CHIM cohort member, Kelsey Conway, and I ran into a fellow alumni from our undergraduate school (University of Mary Washington). We ditched our plans and spontaneously joined her for a lunch at the Seattle Public Library hosted by her Museum Studies program at the University of Washington. We didn’t plan to go to this event (because we didn’t know about it), but I’m glad we did! We ended up meeting other students in the program and listened to their poster presentations. Read more about the AAM conference in my blog post: A Latte of Museum Fun in Seattle. This goes along with the whole spontaneity thing. Just remember, some things don’t always work out as planned. Maybe there are no seats available in the session you planned to attend. Be flexible, and go to a different session. Who knows, you might end up enjoying it. This summer when there was a major delay on the metro during the Society of American Archivists Conference in Washington, D.C., I had to remind myself, “Be flexible.” Maybe it’s meant to be this way. Because of the metro delay, I could not go to some sessions I planned to attend. I still had a great time! Check out my blog post about being flexible at the SAA Conference: Go with the Flow (Even if it’s hard for Archivists). You might be tempted to attend sessions where you know the subject really well. But one of the reasons to attend conferences is to learn something new, right? So try to pick at least one session where you know nothing about. Are you planning on attending all sessions relating to education? Mix it up a bit and attend a session about professional development. You never know what you might learn. Read about my experience of being out of my comfort zone at the Library of Congress National Book Festival: Geeking Out. As you can tell by now, socializing is a high priority for me at conferences. Yes, it is important to learn new things and to attend the sessions, but it is also important to meet new people in your field and see old friends. So when you’re at a conference, try not to turn down a socializing event. Is there a reception? Great! Go to the reception and tell other people to attend too. Do you have some free time to kill before the next event? Great! Meet up with other people from the conference to talk in a more casual setting. At the Mid-Atlantic Regional Archives Conference last weekend, a group of us (from Catholic University and University of Maryland) decided to go to a restaurant (in a historic hotel, of course) while we had some time before the reception. This gave us the chance to meet new people and talk to classmates outside of class. 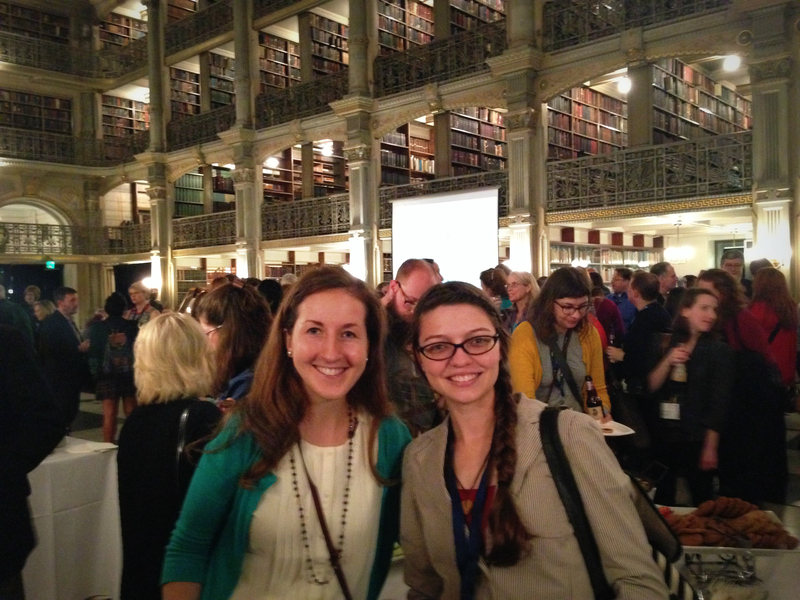 CUA “CHIMers” at the Mid-Atlantic Regional Archives Conference reception at the Peabody Library in Baltimore. Left to Right: Justine Rothbart (me) and Kelsey Conway. October 17, 2014. What’s going to happen when you go home after the conference? What can you do to harness the momentum? While you’re at the conference, make connections with people who live in your geographic region. At the Mid-Atlantic Regional Archives Conference (MARAC), there are different regional caucuses. I am a member of the MARAC DC Caucus and get local updates through e-mail and Facebook about DC related archives topics and MARAC DC happy hours. At MARAC last weekend, I attended the DC Caucus session where we received updates and we able to put a face to the name. Also, share your experience! Tell people that you attended a conference. After the conference, post on your social media accounts or write a blog post. Writing a blog post (longer than 140 characters) about your experience, what you learned, and your thoughts about the conference gives a little more depth and perspective. It is also a good way for you to reflect on your own experience. By sharing your conference stories afterwards, you might encourage someone to attend the same conference in the future or make a connection with someone unexpectedly. After attending the MARAC conference last year in Philadelphia, I wrote this blog post: A is for Archives and Advocacy. A member of the Society of the American Archivists (SAA) Issues & Advocacy Roundtable was grateful I wrote a blog post about their session in Philadelphia and recommended I should write a blog post for the SAA blog! I wrote this blog post for the SAA Issues & Advocacy Roundtable blog called: Oh my gosh, this is so cool! I hope these tips will help you when you attend your next conference. Whether it’s your first conference or your 50th, remember the most important tip of all: Have fun.